This hearty Beef Stew is ready to go in the oven in about 30 minutes. Slow oven heat makes tender beef and savory stew. Great for stocking the freezer! 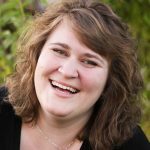 A few weeks ago my sweet sister-in-law asked me if I had a good recipe for beef stew. She is just two weeks more pregnant than I am and beef stew was the order of the day. I grew up on beef stew but it was a throw it in the pot adventure kind of meal. Rachel’s request inspired me to take my childhood version back to the kitchen, measure things, and see if I could outdo my parents’ amazing pots of stew. Of course, since Rachel and I are both starting to feel VERY pregnant the recipe needed to be easy and have an option for freezing the leftovers. This winter we need well stocked freezers against the arrival of little ones. In the end I settled on a rich, meaty version of my parents classic. Mine has mushrooms which build on the earthy meat flavor and it is slow cooked in the oven for maximum tenderness. Rachel and my brother declared it a dinner win. Jonathan promptly forgot I had not yet taken photos for all of you and ate ever last scrap!!! Then I had to make another batch (which he so kindly helped prepare) and he was thrilled to have it even though I had just served it a few days prior. This is a easy, hearty and healthy dinner home run to get you through the cold wintry months. It makes a nice big batch so go ahead and stock the freezer! Tools In This Post: I love to build flavor into meals by using different kinds of bouillon. This one has excellent quality and is often carried by Costco. 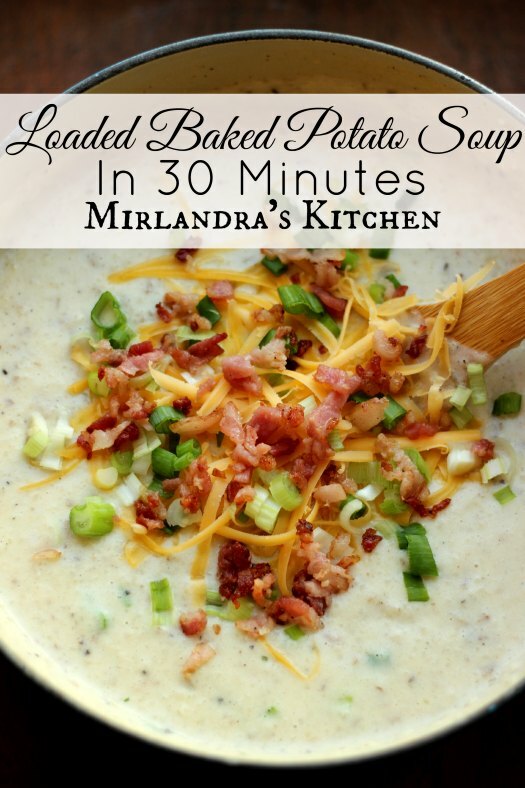 If you like this soup, you will also enjoy my classic Loaded Baked Potato Soup! Note: I like to chop all the vegetables and then the meat before beginning the recipe. Then once I begin, I can simply add what I need as I go. Put a 15-16 quart oven proof pot on medium - high heat. Add butter, celery, onion, mushrooms and the 2 pinches of salt. Sautee until the onion is golden brown, about 8-10 minutes. Add oil as needed to prevent sticking. Remove to a large mixing bowl. Add half of the beef to the pot. Cook it in hamburger fat or oil on medium-high heat until the beef is browned but some red is visible (inside should be very rare). Add it to the bowl with the onion mixture and cook the other half the meat the same way. Put the beef and onion mixture from the bowl back into the pot. Add the flour, 1 tsp. salt and 1 1/2 tsp. pepper, stirring to combine. Add water, bouillon, tomatoes, carrots and potatoes and turn the stove up to high until the stew has come to a simmer. Stir and make sure all the vegetables are submerged in the broth. Cover the pot and transfer to the preheated oven for 1hr and 15 min. At the end of the cooking time, check potatoes and carrots to ensure they are fork tender. (If not, another 15 minutes should do it.) Taste for salt and pepper and adjust as necessary (I like to add a lot more pepper and some white pepper). Garnish with fresh parsley and serve with homemade bread or rolls and butter. This recipe makes about 18 cups of soup, 8oz each. This soup is amazing!! I cut the meat up really small and it was so tender because of the oven. I loved being able to do a few steps and then set a timer and forget about it, letting it cool in the oven! Thanks! I’m so glad you enjoyed it!!! We can’t get enough of it! After I made this I froze some of it. Just thawed it yesterday and heated it up for dinner – takes just as good as the day we had it fresh! yay!! Now – to make more! Awesome! I’m so glad it was just as good for round two. I need to stock the freezer with a big batch before baby. We could live on this stuff no problem!!! Nothing beats a good beef stew for comfort! This looks and sounds delicious! Thank you! I could not agree more. 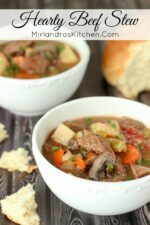 Yummy recipe, nothing like a hearty stew for the cold weather, this most definitely screams home! Thanks! When it starts to get chilly out like this I really get excited about this kind of food! Beef stew is such perfect comfort food. Yours looks fantastic! 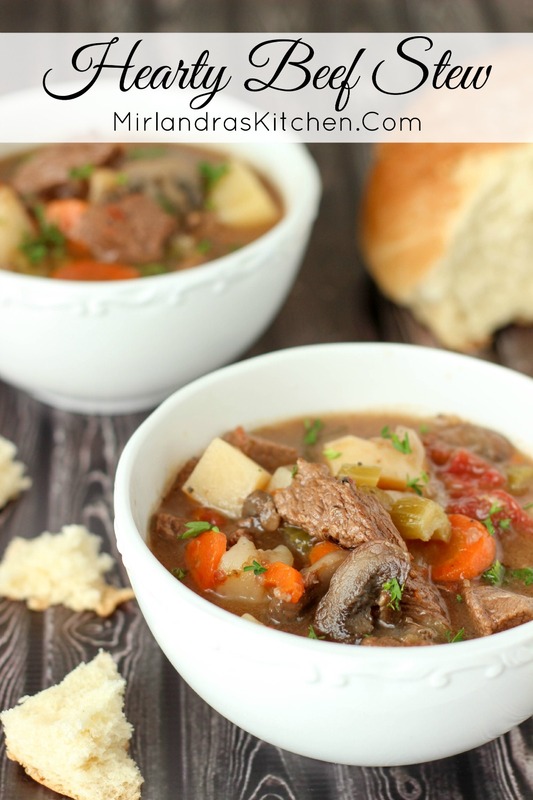 This sounds absolutely delicious, stew is one of my favorite things about fall! Stew and fall were made for each other! This sounds delicious, Miranda, but I have a question–do I really need a 15 to 16 quart pot? Maybe it’s a typo since the recipe only yields 18 cups, which would be 4 1/2 quarts? I am using a pot that size because I like tall sides when cooking. I think that anything with at least a 20 cup capacity would work fine too. Thanks for the clarification, Miraianda (and sorry I misspelled your name earlier)! No worries! I’m glad the clarification helped.